I’ve decided to consult with a garden designer to work out some issues that I have in my garden, mainly that it lacks a cohesive design. I say I recently decided, but truth be told, I’ve been thinking about garden design and getting some help with a garden design for a long time. But first one thing and then another stopped me from doing anything about it. Finally, I banished “first one thing and then another” from my mind and the garden and took the initial step earlier this week. After asking around a bit, I picked a garden designer I thought would create the kind of design I'd like, who would be willing to work with a gardener (versus a homeowner who just wants their yard to look "nice"). On Sunday, I sent off an email to introduce myself and ask her to meet with me to discuss her design and installation services. I held nothing back in my email to her! I told her about my garden, my habit of buying “one of’ plants and planting them wherever there seemed to be a bare batch of ground, as long as it looked like the plants behind them would be taller and those in front would be shorter. I also mentioned that I form emotional attachments to some of my plants. Don’t we all? I wrote that I wanted to work with a garden designer who thinks it is a good idea to devote a third of the back yard to vegetables, knows what a copse is (and can design one), and understands that I will continue to buy “one of” plants and want to plant them in the garden without compromising whatever garden design I’m working with. I gave her all the background I thought necessary, even suggesting that I was willing to remove or move plants that might get in the way of a good garden design. (After I deal with any emotional plant attachment issues.) I bared my gardening soul in that email, but stopped just short of mentioning the hoe collection and how many garden fairies I think are out there wandering around the garden. I wanted her to reply to my email, not run away. And she replied. Turns out she bought the same variety of melon seeds that I did for the same reasons. I think that’s a good sign. The next step is to meet and look around the garden and discuss the services she can offer. I’m sure when she sees the garden as it is now, or how it will be when we meet, she’ll have a few more specific questions about what I want in a garden design, other than a vegetable garden, a copse, and the ability to plant whatever I want and not ruin the design. I’ve given that question - “what do you want in your garden design” - some thought and came up with five elements that I’ll be looking for. Unlike the five secrets to achieving happiness in your garden which were revealed to me gradually over several years, these five elements of a garden design came to me suddenly. I wrote them down so I wouldn't forget them, but I did so in the dark with a pen that was stingy with its ink because the five elements came to mind right before I fell asleep one night. Now i am anxious what will be those five elements. Good for you. Your garden is lovely when in full growth but I am sure you will gain some valuable insights to make it even more perfect. The melon seed connection seals the deal. It's probably a good thing you didn't mention the hoe collection or the garden fairies, Carol:) Good for you for seeking out advice! I've been skimming through garden design books and am thinking of attending a design workshop in late March, but I don't think that's enough for me. I could use a professional eye, too. I love your hoe collection and the garden faeries...just so you know...LOL...Can't wait to see your five elements. I have been slowly developing my design over the last couple of years, every year I move some things around and change something. I call myself a Kamakazi gardener...I like random and I love One Of gardening! Therefore I am designing accordingly! Always teasing us and making us wait. Sigh. I hope there really are five elements and it wasn't just a dream! Oh goody! I hope you can make it your dream garden together. I'm very interested to see what a garden designer can do with a garden such as yours, as mine is similar in the one-of these problems. I think it must be easier for designers to work on a landscape where the homeowners want it to look nice, but more satisfying to work with a gardener such as yourself. Great post -- I'm looking forward to hearing more about it. Dear Carol, I think that this is a very brave step to take. You obviously have a great emotional attachment to your garden and to bare both it, and your soul, to another, albeit professional but necessarily more dispassionate person, is difficult. Although, as you know, I have written a posting on what for me makes a great garden [and by that I am really talking about design], what it all finally comes down to is a balancing act principally between mass and void, light and dark, openness and enclosure, colour, form and texture. But in the end one must garden for oneself and take delight in that. I am sure by working together with your designer you will achieve this. Congrats on the big step, Carol. I hope you and your designer are sympatico and will be brilliant collaborators on your garden. I do think you should mention--nay, trumpet--your hoe collection to him/her. The designer might find a way to incorporate a hoe-inspired work of art into your garden! Can't you just see a spiral of hoes on your fence? Or a hoe teepee as a focal point along a path? Run with your obsessions, girlfriend. That's where genius lies. Exciting! Sometimes I want a designer to come my garden work better too. The garden I have now I've decided will remain a "workshop", but my next garden (because we don't plan to live in this house forever) will have more design and intentionality. Maybe I'll hire a designer or maybe by then I'll be more interested in design myself. Right now I'm just not. Since I am a landscape designer, I was fascinated reading your post and I was thinking of something wise to tell you! My best advice is that every designer has a certain style about their work and it's important to find a good match. I show people my portfolio (you can see a bit online at www.risaedelstein.com) that makes it clear to prospective clients that I am all about plants and all about sustainable and ecological design. This helps my clients decide if I am the right fit for them. My gardens tend to be naturalistic and "messy" and I would be fine with recycled art or veggie gardens in them ;-> The other tip is that good design is about solving problems with good ideas. 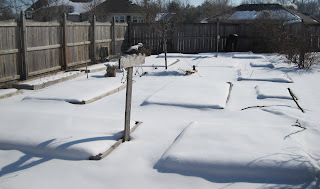 So think about what you want your garden to do that it is not doing for you now. In general, I use lots of pictures to communicate ideas back and forth between myself and my clients so I can get the design right. I always ask them to show me pictures (I with tons of books) of what they love and what they hate so I get a good reading about what would ultimately make them happy. I hope that helps! Well I never ! Did I just see an elephant fly by? You mean you're gonna let someone other than the fairies into May Dreams ? Just kidding, Carol. I think you're wise to hide that hoe collection from a designer 'cause like Pam says they'd probably want to make a sculpture out of it. And you know your hoes would get rusty in those Indiana winters. I'm gonna let the readers of the Garden Designers Roundtable know about this interesting series of posts. I am really looking forward to seeing what you and your designer come up with. It sounds like you found someone who will appreciate your unique point of view (hoe, hoe, hoe). You might want to hold back on telling her about Hortense and Dr H, though. I loved your hoe collection, so glad you included the link. Here we have pickax collections because that's what it takes to work this thin-clay-over-limestone ground. One of my garden requirements is an evergreen belt around the house (we're in zone 8 where that is possible), another is the sight and sound of splashing water, a third is easy-viewing bird feeding areas and butterfly gardens, another is easy-access herb gardens. Our place isn't standard but it has magic. Will look forward to seeing your garden evolve. Carol - Sounds like you embarked on this journey just right and I am sure that it will be a lot of fun for you as you two go through the process. It's her job to cater to your wildest dreams, how much better can it get in the garden? Have fun! We are doing our 1st bloggers design get together here where we gather to help each other brainstorm about problem areas. Can't wait.